Is It a Cream? Is It a Gel? Is It a Sponge? What Is It? However you decide to describe the texture, one thing is for sure: Chanel Emerveille (#82) Illusion d’Ombre Long-Wear Luminous Eyeshadow ($36 for 0.14 oz./4 g.) is full of glorious shimmer and micro glitter! It is a light peach with light, gold sparkle and multi-colored, micro shimmer. The texture is mind-boggling to me, as is not your typical gel or cream eyeshadow, but looks more like a pretty putty-quite malleable. If it had a lower price point, I would most likely scoop it out and roll it into a ball, or some type of figurine. Emerveille is smooth and creamy feeling, but a little finicky when it comes to application. It did not adhere well to a synthetic brush (I tried MAC’s 242) and when I scooped some of the product out with a small spatula, it did not adhere well either, and simply flaked off. 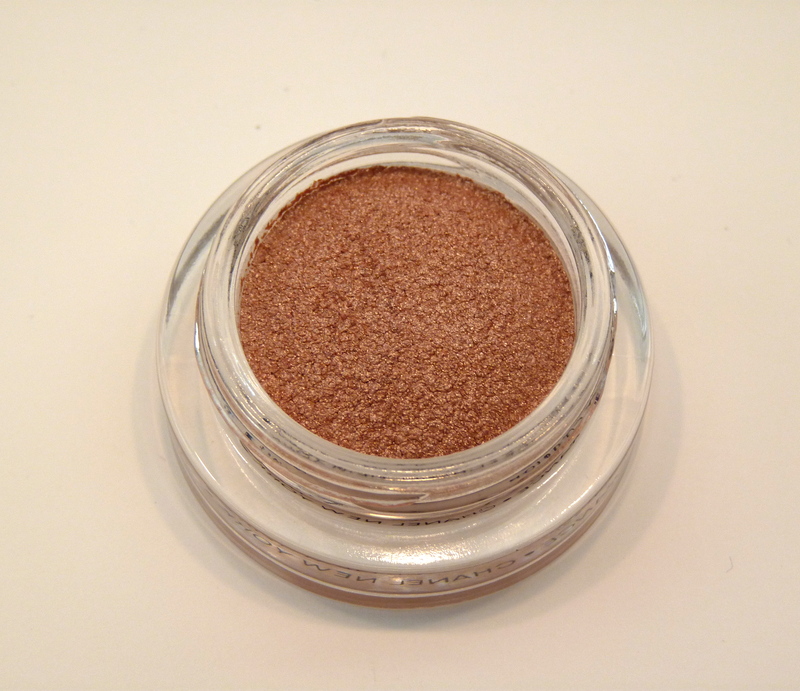 It is best applied using your fingers-the warmth helps transform the shadow into a cream-like texture. If you want to use a brush, which will yield sheerer pigmentation, I suggest using a natural bristled brush (l used MAC’s 239). When using as an eyeliner, I suggest a small angled brush and layering on the color, making sure not to grab too much product at a time or the it will start to flake off. This had really nice pigmentation and I did not experience any fallout when I applied this with my fingers. Some of the sparkles did migrate under my eye after several hours of wear. As Chanel states, this is a long-wearing eyeshadow that was still going strong after 12 hours of wear. 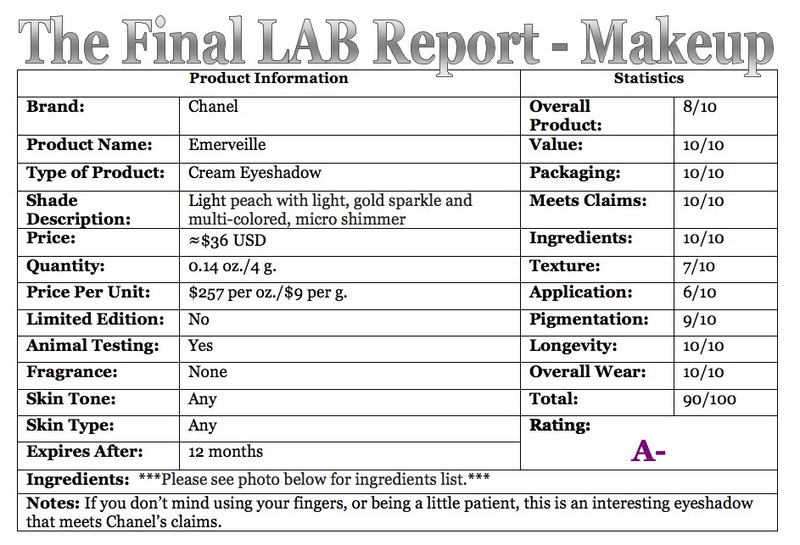 I did not experience any fading or creasing (no base). Although this product performed well, and I love the color, I am not certain if I would repurchase it. The makeup artist within me does not like sticking fingers into jars in order to apply products; it’s too unsanitary. I am curious to see how other shades in this line behave (they may be a little creamier), so I might try one or two more to determine if this is a product I personally like.